On the weekends of 6th to 9th and 13th to 16th September, Watford's historical gems will be opening their doors to celebrate heritage, community and history, as part of country wide Heritage Open Days. 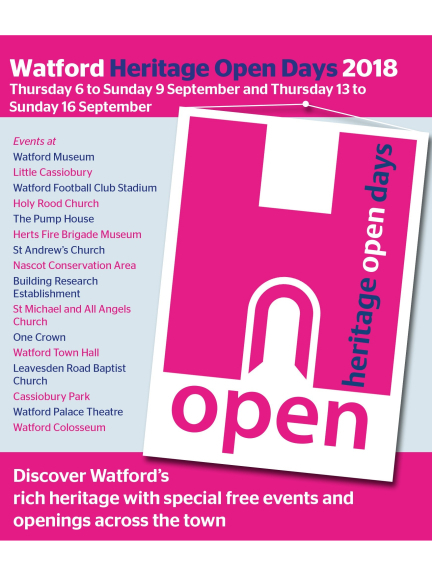 Watford Heritage Open Days 2018, which are organised my Watford Museum, will offer you the opportunity to discover the town’s rich heritage through special free events and openings of buildings, many that you would not normally have access to. To download the free brochure listing all the events and open days, click Watford Heritage Days 2018. Please note that booking is necessary for some of the tours. You can also pick up a copy of the free brochure listing all of the free events and open days taking place from the Customer Service Centre at the Town Hall, Watford Museum or Watford Central Library.